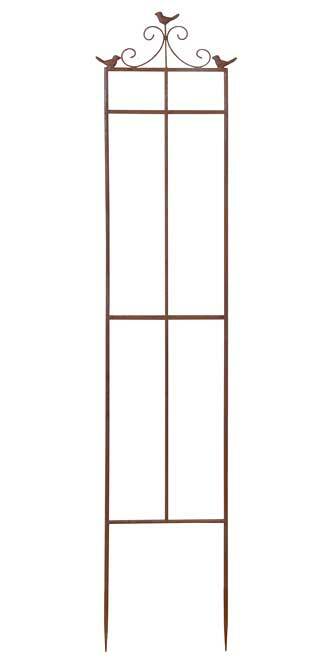 Incorporate your love of birds into your landscaping using the Esschert Design Rust Narrow Bird Trellis. The three bird figurines at the top of this trellis bring a charming look to the piece, and the dual scrolls here add an elegant hint. Round, steel rods create the trellis frame, contrasting the strong angles of its rectangular shape. A vertical, center rod helps visually divide the item, while a few slats intersect it for a large grid. The rusted finish throughout this trellis adds an aged look to any setting, and the item's two pointed legs install into soil in moments. Highlight birds in an exciting way with this Rust Narrow Bird Trellis.